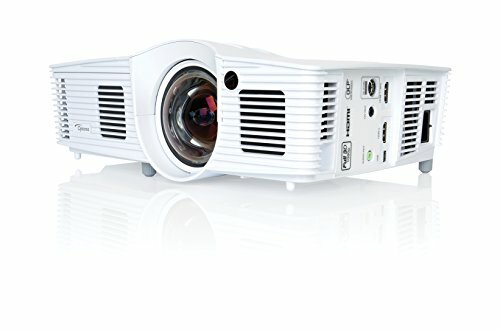 This projector is a DLP projector designed primarily for game playing. It is highly affordable as well. Its embedded audio system and high claimed brightness make it easy to set up as well as to use. Key features of this model include a short lag time (obviously a big advantage in games where reaction time is vital), and a short throw lens (this provides you with big image even in tight spaces). Not just that, but since games involve both photorealistic images and scenes which are visually equal to business graphics, this projector’s focus on games implies it also needs to handle both data images and video well. This means that it doubles as a data projector or a home entertainment one for video. The combination, plus its affordability can make it a really attractive choice, even for those who are not all that serious about gaming. This projector’s sleek design is made for close quarters gaming. It should probably be placed about 4 to 5 feet from your wall. A bulbous lens in the front dominates the panel. On the left side of the lens are horizontal vents that keep this unit cool, yet generate lots of heat. There is a plethora of ports on the right side, you will find everything from mini-USB to an MHL-enabled HDMI connector. There aren’t some ports like VGA or DVI ports, though, but for an affordable projector, this is a really decent setup. There are three rotating pegs on the bottom panel that lower or raise the angle of the projection, whilst the unit’s top boasts basic controls, focus slider, and IR sensor. Colors in data images are nicely saturated and suitably vibrant in majority of the modes. This projector also does pretty good job in maintaining detail across the whole screen. True, there is a little dark in the brightest mode, but this is common with projectors that have significant difference between color and white brightness. Video quality on the Optoma GT1080 is solid, with one pretty odd problem – posterization that is unusually obvious in several predefined modes, especially with recorded or live video content. However, with Cinema mode, you might only notice this with especially demanding images. Very much on the positive side, this projector does a great job in maintaining shadow detail, it delivers good to excellent contrast an color, and it does not show many rainbow artifacts. Pretty good video quality and almost excellent data image quality translates into amazing quality for games. The crisp focus which allows you read small fonts in data images allows you to see a similar range of detail in a game. And, the same capability to handle shadow detail really pays off when you are exploring some dark cave. Most people would consider the projector’s 33.0 msec lag near excellent.